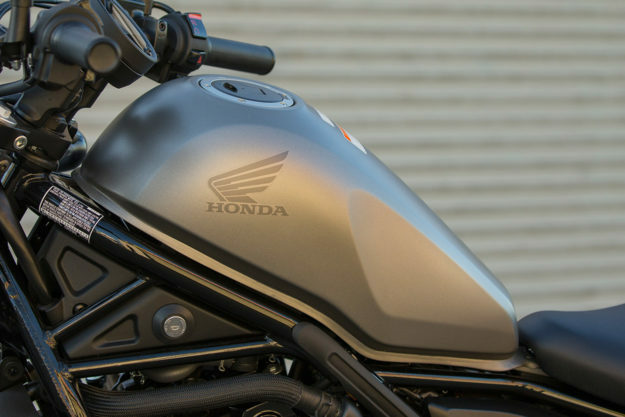 If we were to take a quick poll, undoubtedly we’d find that many of you cut your riding teeth on a Honda Rebel. Thanks to a low seat height, neutral handling and a less than intimidating powerplant, the CMX series became the go-to bike for rider training courses worldwide. Beyond that, since its debut in 1985 the Rebel has also offered a light, fun and reliable cruiser for urban commuters seeking something with a touch of style. But with 31 years on its relatively unchanged clock, the time has come for a serious refresh. 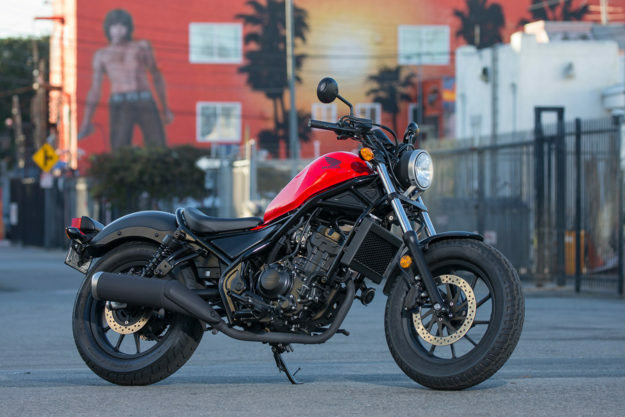 It’s now available in 300cc thumper or 500cc twin variants, and I’ve just returned from a day of splitting through L.A. traffic on both models to see if this new bike is a Rebel in name alone—or if can lead a revolution of new riders into our fold. 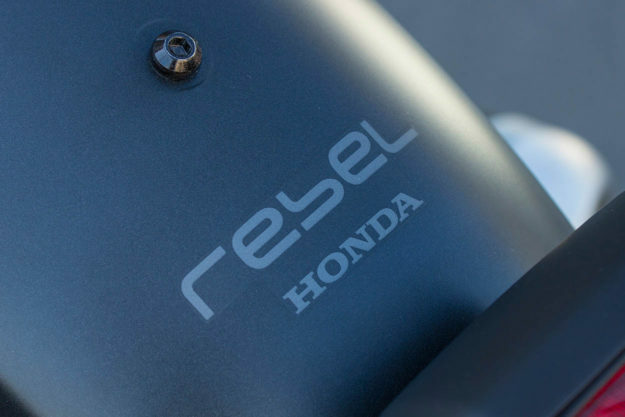 Design There’s no denying the refreshed Rebel was penned with an Instagram feed in mind. And that’s not a bad thing. Unlike the staid and traditional approach of its wimpy looking, mini-me predecessor, this generation will cost a chrome dipper his job in exchange for a completely blacked out treatment. Styling is always subjective but in my eyes, this Rebel has presence. It packs a modern swagger that makes you wanna hop on and wring its neck. More importantly though, the new Rebel has a clear identity and a visually memorable character. Some of the other riders in our group felt that character had tracker roots hiding in there but I’m not feeling it. I say that the arched spine and seat/subframe combo is exploiting full on bobber fashion—a fact the lead designer hammered home with an easy to remove rear fender/subframe mount. 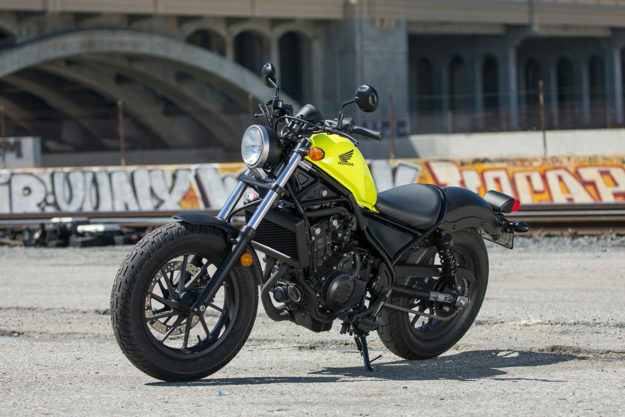 There are no design differences between the Rebel 300 and Rebel 500 other than the engine that motivates them. And with either box ticked, the package is narrow, nimble and approachable—without making the bike look or feel diminutive. Engine and Vital Stats The smaller 300 model is powered by a re-flashed version of the 286cc liquid-cooled, four-stroke thumper found in the CB series. The revised tuning is there to deliver power earlier in the rev range. 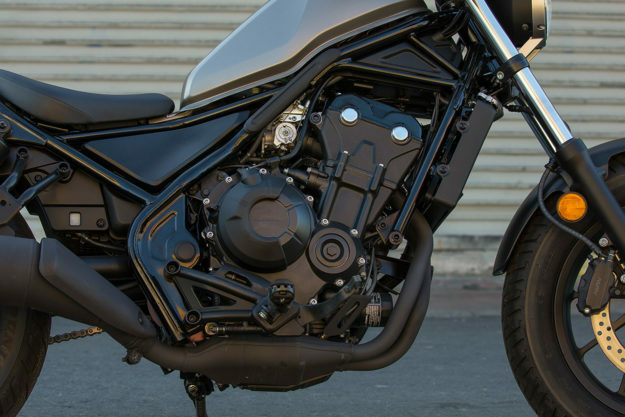 Honda was typically tight-lipped about output numbers, but we figure there are about 31 horses on tap with 20 lb-ft of twist, which is ample for a bike that tips scales at around 364 pounds (164 kilos). 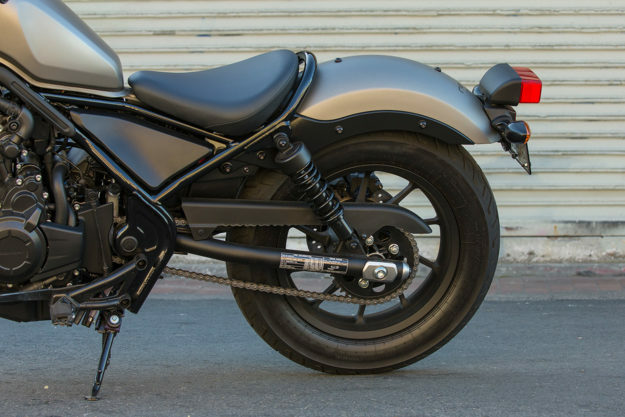 The larger Rebel 500 hangs the CB’s 471cc, liquid-cooled, parallel twin from its trellis frame and features a similar revision to tuning. The extra cubes give riders about 47 horsepower and 32 lb-ft of torque to play with. The bigger motor adds a touch of weight, too. Topping out at 408 pounds (185 kilos), it’s still far from being a heavy bike. And if I were buying, I’d definitely opt for the extra piston to make freeway rides as carefree as possible. Both bikes put power to the road through a six-speed transmission mated to a chain final drive. Motivation is easy and predictable, thanks to spot-on fuelling via analog connections and an easy to operate cable clutch. 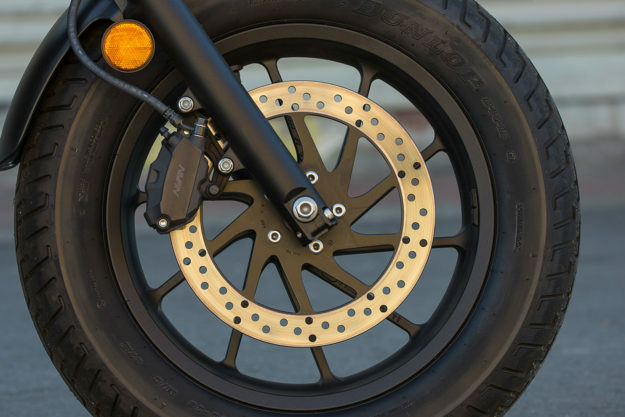 Braking is tackled by identical Nissin single-disc set-ups, both front and rear. ABS is available as a $300 option but experienced riders will probably only see it as a 6-pound penalty. Ergonomics One of the Rebel’s ever-enduring hallmarks has been a low and approachable seat height and that hasn’t changed here. The saddle sits comfortably at 27.2-inches, meaning nobody a smidgen over three apples would have an issue being flat footed when riding the Rebel. 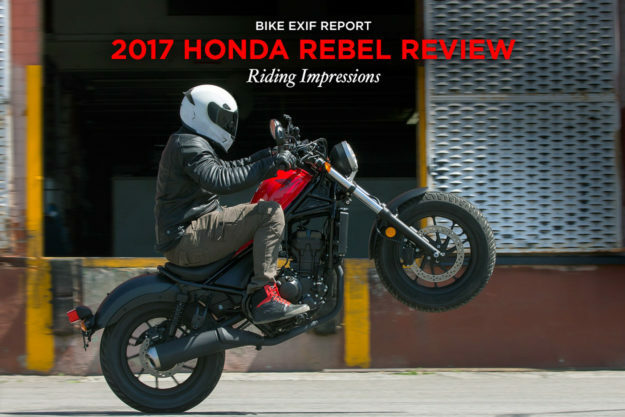 At six feet tall, I was more worried about feeling cramped on the Rebel than scrambling for purchase, but was pleasantly surprised. The pegs sit comfortably between mid and forward positioning and the bars are an easy reach, creating an engaging yet relaxed rider triangle.